We rode. We saw billboards. We conquered. 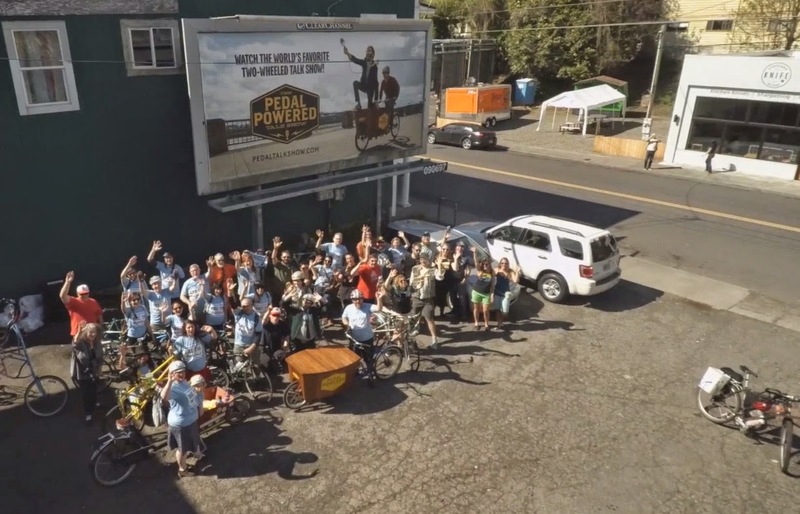 This past Sunday, a few dozen friends and fans joined us at the Keen Garage to set out on a bike tour of all four of our billboards in celebration of our fourth season. 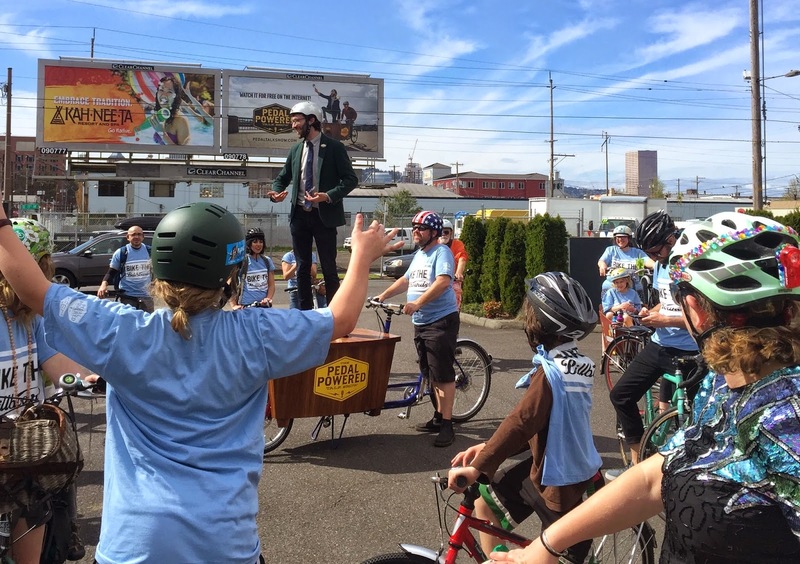 Led by our esteemed Route Director, (and founder of the Ginger Ride and former Pedal Powered Talk Show guest), Jessica Vredenburg, we crossed Burnside and meandered through downtown, passing our very first billboard on our way to Waterfront Park. We headed over the Hawthorne bridge and into Southeast before arriving at billboard #2 where I climbed atop the bike/desk to make a few official proclamations and thank a few of the folks who made our ride possible such as Clay Nowak (who designed our billboards), Blakely Dadson and Zo Barazzuol (who designed the shirts), KEEN (who got our shirts printed) and Alex Simon (another former guest, who accompanied the entire ride on bugle). 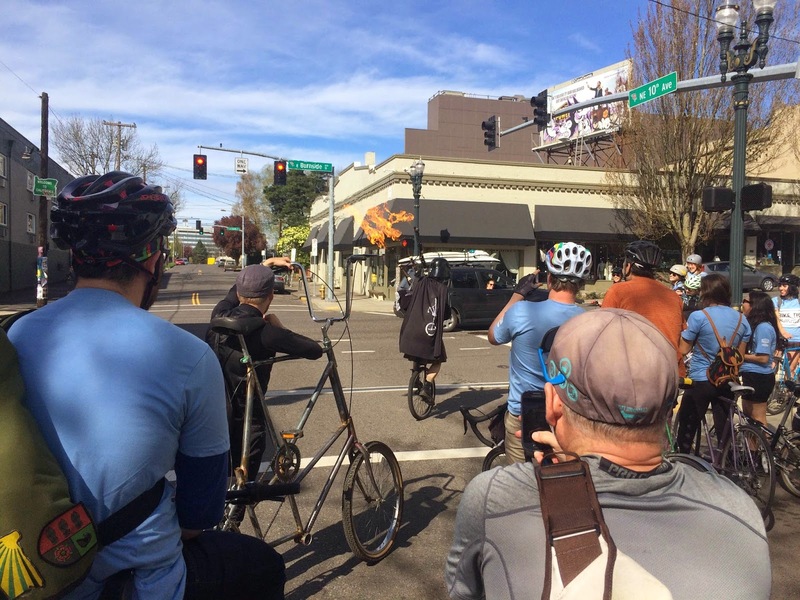 After a killer hill, we made it to billboard #3 where our friends from Portland’s Grilled by Bike Club were grilling up tasty veggies and sausage to share! And did I mention that Olive and Dingo, two renowned local clowns, just happened to bike by our ride and joined us for a few stops! Next we headed North for a surprise stop at Alma Chocolate. We filmed an episode in their shop a few weeks back that we’ll be releasing soon and Sarah Hart and Ruth E. Fox generously invited our giant gang inside the store for some sweet treats. Next we were off to the last billboard where former guest, The Unipiper, was waiting for us with bagpipes aflame! The Unipiper led our merry gang to our final destination, Bunk Bar (where we shot an episode way back in season 2), where trays of free snacks awaited us! 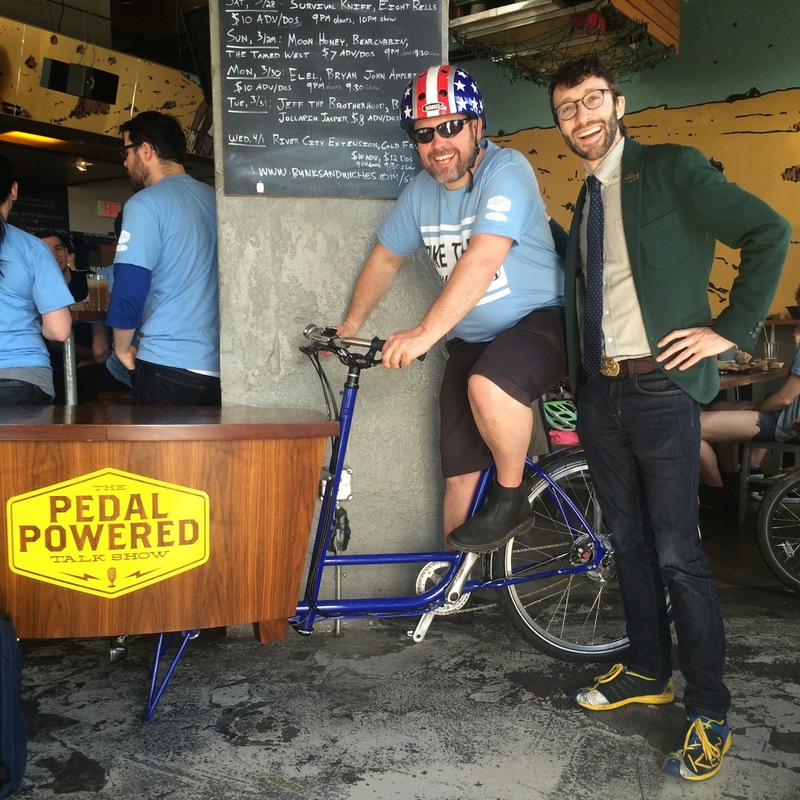 Thanks to everyone who joined us for our first ever BIKE THE BILLBOARDS extravaganza! And for all of you who didn’t make it: you missed out big time.